The Space Review online publication has published an excellent article by Mike Snead, president of the Spacefaring Institute, supporting the USA taking the lead in space-based energy. The article also encourages citizens to sign both of our petitions to send this important message to the US Congress. Human civilization has been very fortunate to have access to readily available fossil fuels to enable the industrial revolution and the rise of our modern society. However, as most now understand, environmental and energy security concerns have emerged from our substantial use of fossil fuels. Our thanks to Mike Snead for his concise and compelling arguments in favor of space-based energy, and also thanks to Jeff Foust for publishing Mike’s article and helping us to get the word out to a much wider audience. Click here to read Mike’s entire article on The Space Review online publication website. Click here to read more of Mike’s writing on his Spacefaring America blog. Please share this video and help get the word out, and please sign the petition at change.org. Citizens for Space Based Solar Power has published the following petition, addressed to the President of the United States, the U.S. Senate, and the U.S. House of Representatives. Please go to change.org and sign this petition to send a strong message to the President and to Congress: Take these actions now to transition our nation and the world from dependence on fossil fuels to a virtually unlimited source of clean, sustainable energy. Your signature on this petition will have a very real and positive impact on the United States of America and on all future generations of humankind worldwide. If you doubt this statement, please read on. The United States of America faces a looming national energy security threat due to its dependence on a finite supply of fossil fuels. Humankind worldwide faces an environmental security threat due to its dependence on fossil fuels that release carbon dioxide into the atmosphere when burned. The human desire to improve our standard of living is driving both the United States of America and humankind worldwide to consume more energy per person than ever before. Worldwide population growth, coupled with increasing energy consumption per person, is increasing the total amount of energy required to sustain humankind worldwide. There are no terrestrial energy sources, renewable or non-renewable, that can be sustainably scaled to meet the planet’s increasing energy requirements. Sustainable, carbon emission free energy from space-based solar power (SBSP) is the solution. Simply put–and challenging to accomplish–SBSP consists of orbiting solar power satellites continuously harvesting the sun’s intense energy in space. The energy is beamed wirelessly to rectifying antennas on the Earth, and then transmitted to existing electrical power grids. Unlike terrestrial renewable energy sources, space-based solar power is nearly infinitely scalable. It is also continuous, so it can supply the planet’s baseload energy requirements. Space-based solar power is not a new idea. Peter Glaser, an American scientist, obtained U.S. Patent Number US003781647 for SBSP in 1973. Since then, the idea has been studied extensively by NASA, other government agencies, academic groups, private organizations, and individuals. Every technology required for the implementation of SBSP exists, and they are each well understood. Transitioning the United States of America, and eventually, humankind worldwide, to sustainable, carbon emission free space-based energy will require a substantial, coordinated effort, sustained economic investment, and political will. Likely to span the rest of the twenty-first century, commitment to this effort must supersede the short-term nature of two- and four-year election cycles. Pass and support legislation to ensure national energy security and to protect the worldwide environment by establishing congressionally chartered public-private corporations for space-based energy, space mining, and spacefaring logistics. These corporations shall provide the United States, its allies, and trading partners with sustainable and carbon emission free space-based energy. The United States of America has a proven track record of success with large and difficult challenges, like building a transcontinental railroad, building a national highway system, and creating an extremely successful communications satellite industry. In 1957, the Soviet Union successfully launched Sputnik I. The following year, the U.S. Congress passed the Space Act and created NASA. In 1961, John F. Kennedy challenged our nation to claim a leadership role in space and land a man on the moon within the decade. In July of 1969, the Apollo 11 spaceflight landed Americans Neil Armstrong and Buzz Aldrin on the Moon. The Apollo Program went on to send ten more astronauts to walk on the Moon. Today Japan, China, and India all have active space-based energy development programs. The main challenges to implementing a successful space-based energy industry can be categorized in three areas. 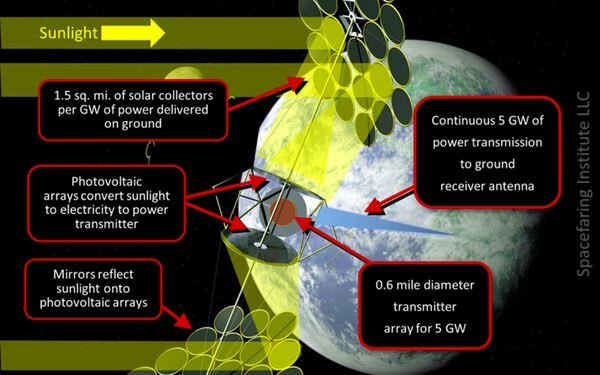 Several viable space-based energy concepts have been proposed. The concept for implementation must be downselected through scientific experimentation and prototype testing. The safety of space-based energy, with respect to people, animals, and the environment, must be demonstrated through scientific experimentation and prototype testing. Launch costs to place the required mass of solar power satellites into orbit must be reduced to improve the business case for space-based energy. Advances in commercial launch capabilities, material sciences, robotic assembly methods, and other related technologies must continue to improve the business case for space-based energy. The economic effort to implement space-based energy will be substantial, likely requiring a small but significant fraction of the U.S. Gross Domestic Product (GDP) to be invested. Initially, a return on that investment will come in the form of new industry and job creation, and spinoff technologies. Sustained investment will likely be required for the remainder of this century. The commitment to implement space-based energy will likely span the rest of this century. This long-term commitment must supersede the short-term nature of two- and four-year election cycles. A decision must be made as to whether the United States of America will solely take on the challenge of implementing space-based energy, or whether the United States of America will lead a coalition of our allies and trading partners in this effort. Public opinion must be rallied to support the technology of space-based energy, and the economic and political commitments required for its successful implementation. This is only a small portion of the available space-based energy resources, presented in no particular order. Additional Google and YouTube searches are highly recommended. 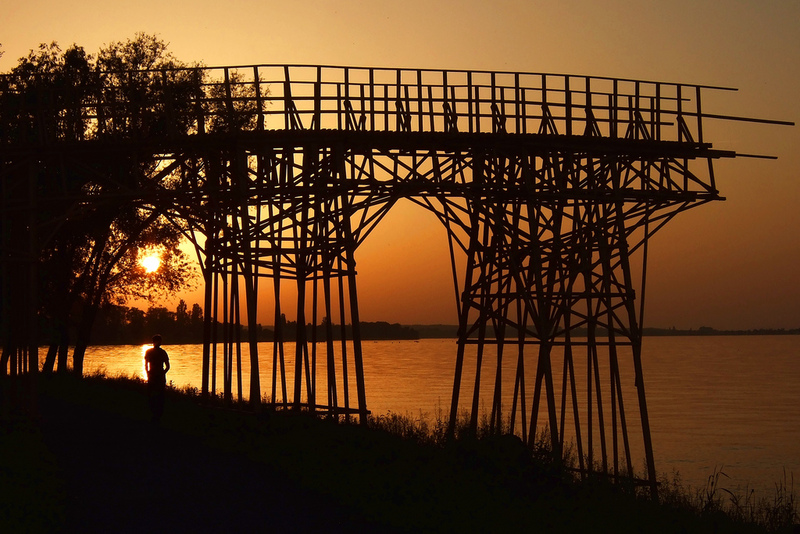 Will Fossil Fuels Be A “Bridge to Nowhere”? Every form of energy we have can eventually be traced back to the Sun. Space based solar power solves the on/off problem of terrestrial solar power, and could be delivered nearly anywhere on the planet 24/7/365. These characteristics make space based solar power a virtually unlimited, clean baseload power source. Currently, payload launch-to-orbit costs are the single biggest hurdle to developing and deploying space based solar power. While it would be a massive and complex engineering project, no basic science breakthroughs are needed before space based solar power could be implemented. Space based solar power is not a short-term solution to our energy needs. Domestic fossil fuel resources would provide a “bridge” to its eventual implementation … but fossil fuel will be a “bridge to nowhere”, unless we start developing space based solar power very soon. *I’m a purely self-appointed advocate, and I have no financial stake in space based solar power. I simply believe that it will eventually be the solution to our energy future. Author Rob MahanPosted on August 28, 2012 Categories commercialization, energy conversion, fossil fuel depletion, future energy needsTags baseload power, bridge to nowhere, eventual implementation, fossil fuel, fossil fuel resources, science, space based solar power3 Comments on Will Fossil Fuels Be A “Bridge to Nowhere”? I came across this recent TED Talk and the presenter eloquently summarized, in so many words, why it would be prudent for humankind to begin an earnest effort to make space-based solar power a reality. He believes that humans are highly intelligent and innovative, enough to solve the problem of over-exceeding the planet’s carrying capacity with no sign of recognition that infinite growth is a myth, a pipe dream. According to Gilding, the only thing humankind lacks to begin solving this problem is a truly major worldwide financial crisis . . . the kind that could be precipitated by the collapse of today’s oil and coal industries. Are we, as card-carrying members of humankind, so focused on our own navels—so not nearly as advanced as we think we are—that we need a massive, painful crisis for motivation? Why not just skip the crisis and start solving our problems now? Sounds like a better plan to me. What do you think? Link to original Ted Talk if the video above does not play. I am very pleased to learn about your involvement in the energy future of our planet. I agree that clean, affordable and available energy is the overriding issue for the future development and well being of the entire human race. My wish is that you will take a serious look at space-based solar power. I believe it can be a game-changing base load power source. When funded, developed and deployed at the required scale, space-based solar power addresses your requirements for zero carbon emissions, ease of distribution, relatively small earth footprint and zero waste generated. Uranium is a finite resource, though longer range than conventional fossil fuels. Space-based solar power can provide energy to the earth until the sun burns out. The website Citizens for Space Based Solar Power is one of many places to begin a review of the current state and potential for space-based solar power. You could be the voice this technology has been seeking. This 18 minute TEDx London presentation by Peter Sage of Space Energy presents current information on just about every aspect of Space Based Solar Power. Although my usual sources have been quiet lately, apparently there is a lot still going on towards launching this game-changing and unlimited source of clean, available baseload power.